I had an audience with Dr. Moulton once. It was an honor and a pleasure. Besides the history lesson of the brand and desire for recognition of his legacy, Alex wanted to talk to me about Jan Heine. Jan had written a critical review of Moultons after crashing on one and Alex felt he had been dissed. The politics of that article, I’ll leave to Moulton’s heirs and Jan, but I got schooled in high-pressure, small-wheeled tires with full suspension by the good doctor himself. As a proxy for Jan, I heard a very strong argument against low-pressure, 650b tires and how more cyclists should’ve ridden suspended bikes. Alex believed he’d found the bike design holy grail: horizontal stiffness and vertical compliance. He figured out, with suspension, how to propel a cyclist comfortably forward with an efficient drivetrain. The bikes I rode at his estate were Rolls Royce smooth with a bottom bracket that didn’t move. 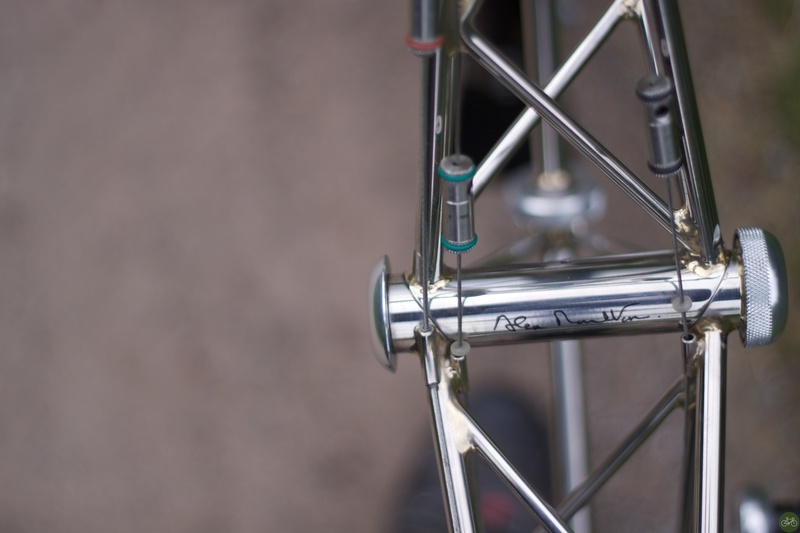 The space frame from Moulton was revolutionary, but as history showed, few noticed compared to traditional, double-diamond frames. In honor of Moulton’s contribution to the bike, below is an edit of video taken during our meeting. In it, Dr. Moulton explains how his work on the original Mini, a small-wheeled car, led to the spaceframe bicycle. He also wanted to design a bike without a top tube to prevent accidents and make stepping onto and off the bike easier. Interest in the bike for him came from the Suez Canal crisis. Before that in the UK, you just rode for fun. To Moulton, like Sir Alec Issigonis, wheel size had enormous importance upon the architecture of the entire vehicle. Noteworthy that the wheel size discussion continues today. Also suggest reading the Spaceframe Moultons for the history of the brand, industry intrigue, and how fame is fleeting. I traveled with a TSR2 last year. See more photos on Flickr and on G+.